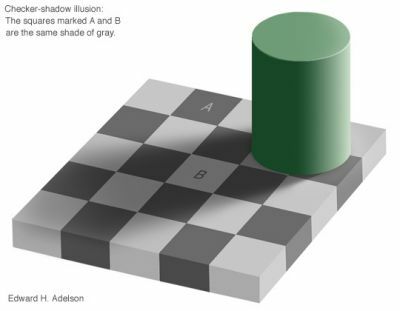 The Checker Shadow Illusion is the most mysterious optical illusion I have ever seen. No matter how long I stare at it, I can’t convince my eyes to believe it. The two areas marked A and B are the same shade of grey in the picture. Print it out and fold the two parts together if you don’t believe it! The illusion was created by Edward H. Adelson, Professor of Vision Science at MIT. His website has some more interesting illusions as well as a lot of theory to explain them. This Uncategorised is about art, science. Bookmark the permalink.